In our long history of construction, paneling has run the gamut from ornate boiserie to simple sheets of plywood. 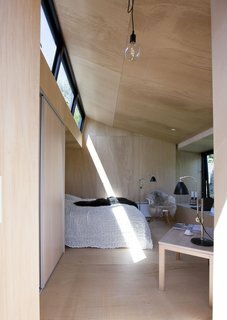 To follow are 8 very different rooms that implement paneling in a modern way. In Præstø, on the Danish island of Zealand, a guesthouse infuses the regional vernacular with Japanese influence. The interior is small, but comfortable. It fits a double bed, coffee table, and chair. 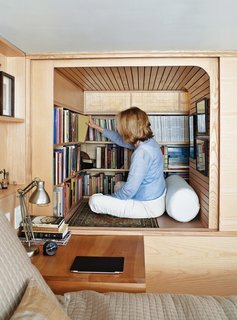 The bed is recessed into the wall so as not to waste any space. Natural light floods the interior from a clerestory. Faced with the challenge of a diminutive New York apartment in desperate need of a refresh, architect Tim Seggerman went straight to his toolbox to craft a Nakashima-inspired interior. Photo by David Engelhardt. 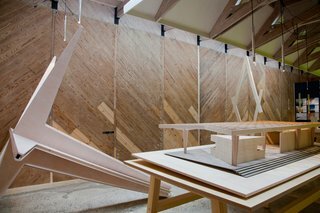 Alvar Aalto’s Finnish Pavilion for the Venice Biennale, originally designed as a temporary demountable structure, was built in 1956 and stayed solidly in a place for nearly 56 years until a tree fell on the structure. The structure was entirely dismantled, lovingly restored, and reassembled, by Gianni Talamini—a project that has awakened fresh attention to Aalto’s famed building. Photo by Patricia Parinejad. In the Venice, California, home of architect Lorcan O’Herlihy, operable panels of the built-in cabinetry, in chocolate and caramel colors, offer cues to the color palette of more mobile furnishings. Using the same panel material, the architect customized a West Elm couch for the living room. Photo by Misha Gravenor. São Paulo architect Isay Weinfeld's Casa Deck offers cinematic vistas, a lush garden, and a retreat from Brazil's largest city. 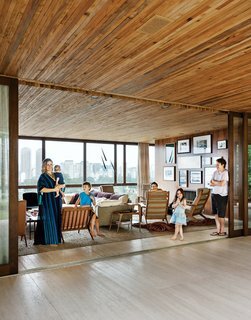 With São Paulo on one side and a terrace and garden on the other, the Strozenbergs’ living room feels vast. The sofa is a Harry Large by Antonio Citterio for B&B Italia and the coffee table behind Ticiana Strozenberg (with baby) is a vintage design by Geraldo de Barros. The custom wood paneling throughout the house is by Fiamoncine, as are the window treatments. Photo by Matthew Williams. 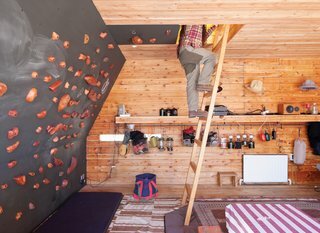 Setsumasa and Mami Kobayashi’s weekend retreat, two and a half hours northwest of Tokyo, includes a rooftop tent that can be accessed from the interior via a wooden ladder or—for the more athletic—via a series of wall-mounted climbing holds, made by Vock and carved from persimmon-tinted hardwood. Photo by Dean Kaufman. Built-ins abound in this renovation of a 1970s lodge perched high in the French Alps. H2O Architectes devised a plan to increase livable space while leaving the structure intact. Panels slide open to connect the spaces, or closed for privacy. On a lakeside plot outside Toronto, four friends forge a new kind of vacation house. 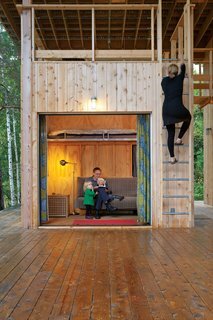 The vacation complex is designed to promote an easy flow between the two families' spaces, which include guest cabins and a shared porch for hanging out and eating. This outdoor room is sheathed in warm wood paneling. Photo by Lorne Bridgman.